While attending the dawn service of Ascension, Felicity is horrified to see someone fall from the tower and land at her feet. It seems there is another mystery when she picks up a piece of paper with a strange symbol that dropped from the victim’s fingers and it bursts into flame as she opens it. Although it looks like an accident or suicide, it’s obviously a murder (otherwise why is it the opening scene in a book series called The Monastery Murders? ).Felicity agrees to accompany her fiancé, Antony, to supervise a pilgrimage to Wales for teenagers as a way to get her mind off the fatal fall, but that’s not easy with her dreams. And when she finds the strange symbol represents an ancient heretical society, it seems escaping might be harder than she thought. This is a murder mystery, and starts well with a body appearing almost immediately. But the mystery of poor Hwyl’s death is then ignored as Antony and Felicity go walking in Wales, and apart from the obvious fact that Hwyl is Welsh, this has no apparent relevance to the mystery. In fact, I was about 75% of the way through the novel before they started to address the mystery at all, and then it was quickly apparent (to me at least) who was behind it. The walk, as described, was much like I imagine a real walk across Wales would be: long and boring, with occasional short bursts of action. It was supposed to be ecumenical (i.e. representing all the Christian world), but was actually Anglican—and high Anglican at that, complete with bells and smells, praying exclusively out of the prayer book, and saying the Stations of the Cross at regular intervals. This wouldn’t have bothered me except the characters made a point of saying the walk was ecumenical, and it detracted from what was supposed to be the mystery of Hywl’s death. An Unholy Communion made a lot of references to deliverance, exorcism and demonic powers working against Christianity. While this was relatively well explained, I didn’t feel either of the main characters had real understanding. Antony displayed a solid practical understanding (e.g. knowing which prayers to pray), but didn’t seem to see the bigger picture linkages (like wondering if two teenagers who wear black decorated with black and constantly quote Twilight are actually Christians). And Felicity seemed to be entirely ignorant of the dark side—she reminded me a little of some of Dr Who’s companions from the 1960’s.One bugbear I constantly have with American authors setting books in Britain is their research and language. I was happy to find the research in An Unholy Communion was excellent (as I expected it to be. I’ve read several of her historical fiction epics, and they were outstanding). Given all the excellent research, it was distracting to see language issues: the reference to Cwm Rhondda spelled incorrectly, and the very English Antony using several Americanisms (gotten, granola bar, grill). 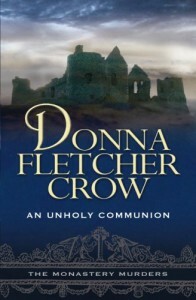 An Unholy Communion is the third in The Monastery Murders series, the first one I’ve read and probably the last. It didn’t work for me as a murder mystery, and I didn’t like the characters sufficiently to care what happens next. Thanks to ARCBA, Lion Fiction and NetGalley for providing a free ebook for review.